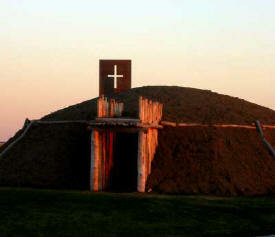 Above is a recreated 16th Century Mandan earth lodge, shown here with our bell banner in the background. We refer to our founding sisters as pioneers into the unknown as well, as they were really the first women in the rugged Dakota Territory to establish formal education and healthcare over 130 years ago. Most of the monastery land has never been plowed, leaving the chokecherry, buffalo berry, and other native trees, grasses, and wild flowers. They are descendants of those that were here when the Corps of Discovery passed this way 200 years ago. Click here to learn more about the native plants and animals that grace our monastery property. You are welcome to visit us here on the banks of the Missouri River. Explore the site of the 2004 Lewis & Clark Signature Event hosted by the University of Mary, one of our sponsored institutions. Annunciation Monastery is approximately 7 miles south of Bismarck. Just follow Airport Road, which winds into University Drive until you see our sign. Our 100 foot landmark bell banner designed by the famed architect, Marcel Breuer, can't be missed. Our monastery is located directly south of the bell banner. What Will You Encounter When You Arrive? Encounter our Benedictine hospitality firsthand! Our Hospitality Center is open for organizational events and we welcome individual visitors of all faiths. Spend some time enjoying the breathtaking view from our dining room, browse our gift shop, or if you wish, join us in our daily praise in our chapel. You might want to plan some time to walk our Labyrinth, an ancient spiritual tool, that forms a walking path in the shape of a spiraling circle. Our Labyrinth is located east of our monastery, a short walking distance from our front doors. Take some time to walk in peaceful prayer or reflection. Our gift shop is located on the main level of our monastery. Most of the items are hand-crafted by Benedictine Sisters. You will find handmade afghans, bookmarks, cards, baby blankets, booties, dolls, rosaries and medals. One of our Sisters sells her beautiful pottery and candles in our gift shop also. Each piece tells its own story with its array of colors common to our prairie landscape. Take time to enrich your spirit by participating in our many events here at Annunciation Monastery. Click here to see what we have to offer. We invite you to join us in daily praise in our fieldstone chapel. If you are yearning for a prayerful place to worship, we welcome you to pray with us. All faiths are welcome!